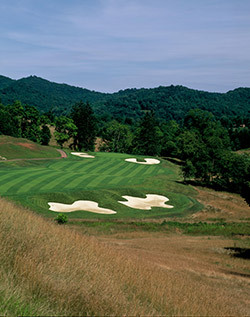 In this installment of our state park golf course series we visit Stonewall Jackson Lake State Park in the Hills of West Virginia where Arnold Palmer created something very special for the folks at the resort. The course opens on the shores of Stonewall Jackson Lake then winds its way up and away from the lake and into the foothills. 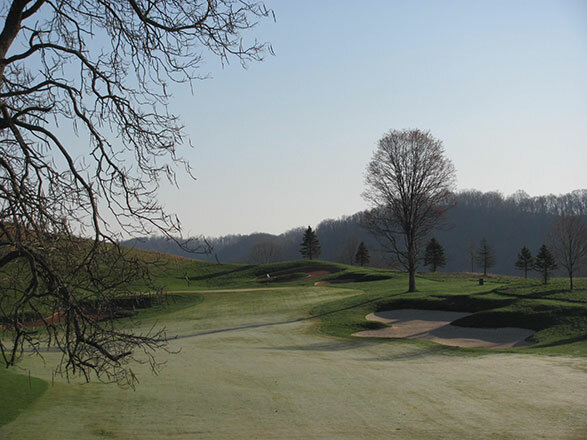 The King managed to route the course around a mere 120 acres of land through creative use of the existing hilly terrain, stands of forest and the rambling creeks that twist and turn throughout the property, all of which are characteristic of this part of West Virginia. 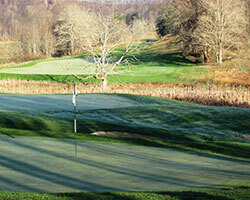 There is good separation between holes and at no time during your round will you feel congested. There are six sets of tees so if played from the appropriate distance an enjoyable round can be had by all and the early riser or evening round player may find themselves playing in front of a gallery of deer and other assorted wildlife that call the park home. So if you find yourself traveling the I79 it’s well worth the 5 minute detour east off the highway. 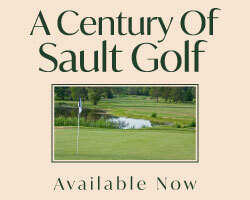 Access: Green fees are available to park patrons and hotel guests. Stonewall is a course where shot makers feel at home and five holes here have been added to our "shot maker's" collection. The picturesque collection of par three’s all require precise distance control if four 3’s are to be marked on the card, with hole 6 a stand out. 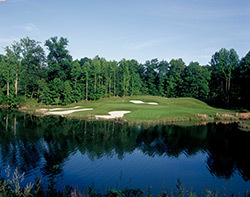 A well struck mid or short iron is the club of choice to carry an inlet of Stonewall Jackson lake and three deep fronting bunkers to reach this slightly elevated green site. The putting surface slopes steeply from back to front so care must be taken to stay below the hole. In addition to the 6th hole there are four really demanding par 4’s that require your utmost attention and shot making prowess for a good score to be posted. Holes 5, 8, 13 and 17 play 429, 417, 450 and 455 yards so solid driving is required. A drive long down the left center over a rise is required on hole five to take full advantage of the downhill left to right cant of the fairway to maximize driving distance. The fairway continues to trend downhill to the green which is wedged between a hill left and the banks of the lake right. 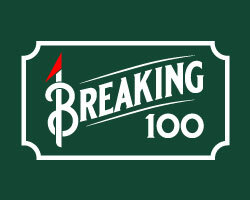 A precise second is needed to set up the birdie attempt for the miss right is wet and the bail-out left will leave a very tricky downhill chip. The eighth hole is a sweeping dogleg left. A drive down from the elevated tee should find the right centre of the fairway at the dogleg. An attempt to cut the corner will result in a search in the forest while the long right side miss may find you exploring a small pond at the outside corner of the dogleg. The approach is a blind shot straight uphill to a steeply sloping green protected by a fall off right and a fist full of bunkers short left. Lucky 13 is a beastly dogleg right where the drive must carry scrub and two right side fairway bunkers to find the desired landing area. The fairway is undulating and sloped left to right so there is little chance of finding a flat lie making the uphill approach shot to the green a tricky one indeed. 17 is a straight away hole, however, a left side drive will be forced to contend with a large tree which calls the 100 yard wide crossing swamp at the end of the driving area home. The short left approach shot to this kidney shaped green will find heavy rough or a deep faced bunker while long and right will also suffer the same fate. Although this collection of shot maker's holes are demanding, as are most of the other holes at Stonewall, Palmer designed openings at the entrances to most of the green sites affording the shorter hitters playing a ground game an opportunity to gain access to the putting surface. 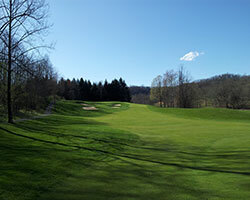 A creative design and well routed thought the scenic property Stonewall is a must I79 play.